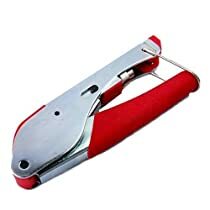 Universal Compression/Crimping Tool. Works with RG-6, RG-59, RG-58, compression connectors. Pre-calibrated and easy to use. Compatible with almost all connectors, e.g. PPC, Digicon, Gilbert, Holland, Thomas And Betts Snap And Seal, Ultrease, Stirling, Lock And Seal, etc. Perfect for Satellite TV, CATV, Home Theater, and Security. Permanent connection so your connector never comes loose. The best value out there for crimping compression F Connectors! Worked fairly well, but on my first attempt the connector crimped at an angle. When you place the coax & connector in the slot, the tool only provides support for 1/2 of the connector, so you have to apply pressure slowly and then rotate the coax cable to get an even crimp. Version with reversible plunger works great for me. I needed a cheap RG6 connector solution for making and repairing a few cables. There is so much bad information about crimpers and connectors out there, I wasn't confident this one was going to work but I took a chance and it is just what I needed. There are two versions of the red crimper; one with a reversible 2 plunger insert with a red piece that sticks up a bit and another with a flat red plastic bit behind the permanently attached plunger. Mine is the first one...with the 2 plunger insert. (The other may work but I don't know for sure.) I got mine with kit from nda-electronics that included the crimper, a coax stripper, and some RG6 connectors. I received it in two days. 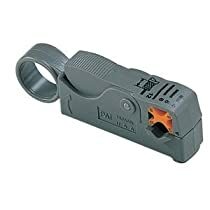 The crimper can be used with RG6 compression connectors that are 1.25" total length uncompressed or very slightly longer . I've used the all metal connectors provided with the kit and also some PPC-EX6XLPlus connectors. It works perfectly on both. The other longer plunger might work on non-XL connectors but I can't be positive it's long enough without trying it. From what I've read, the XL connectors are the better choice anyway and I don't see how a saving a few millimeters is going to help anyone. If it's that close, it means you are probably bending your cable too tightly anyway. I had few twist-on RG6 connectors in my house and after I saw how much better the compression connectors are, I replaced them all immediately and won't ever use one again. There are good videos on Youtube on how to use the crimper. It is simple enough anyone should be able to do it with just a bit of instruction. Just eh. I've used better ones, this is a little cheaply made, and hard to compress. Get yourself a Klein if you're doing work with coax.